After seeing all the assortment of pumpkins at the grocery store, I decided I needed to make Pumpkin Chocolate Chip Cookies. 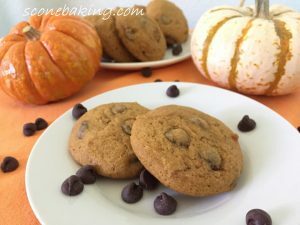 These soft and chewy cookies have a hint of pumpkin pie spice and are loaded with milk chocolate chips. I find that milk chocolate chips pair better with pumpkin rather than semi-sweet chocolate chips.